ne imao od srca poroda,ni muškoga ni devojačkoga! Od ruke mu ništa ne rodilo,rujno vino ni pšenica bela! I've always believed that there's nothing stronger that your love for family and country. I amuse that's the reason I find Kosovo's curse so passionate and impressive. 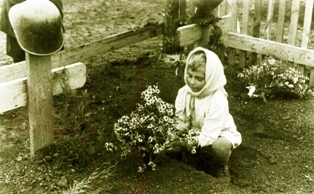 I'm not a Serb, as the picture shows (Romanian girl at an unknown world war II tomb) but I can fully understand the importance of Kosovo in Serbian history.